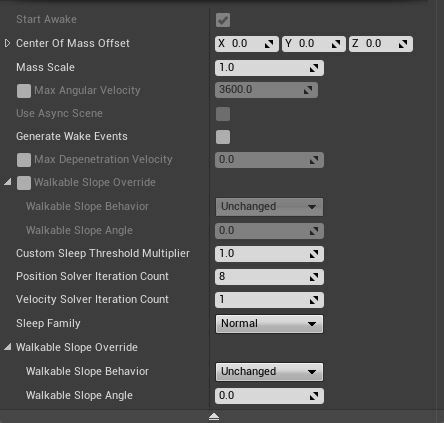 Lets you manually control the physics/animation. Time between poking ragdoll and starting to blend back. Scale factor for the gravity used in the simulation. Strength of the impulse used when poking with left mouse button. Whether to draw constraints as points. Whether to draw bone names in the viewport. Controls how large constraints are drawn in PhAT. Used in the PhysicsAsset case. Associates this Body with Bone in a skeletal mesh. Should this BodySetup be considered for the bounding box of the PhysicsAsset (and hence SkeletalMeshComponent). There is a speed improvement from having less BodySetups processed each frame when updating the bounds. If Unfixed it will use physics. If fixed, it will use kinematic. Default will inherit from OwnerComponent's behavior. Physical material to use for simple collision on this body. Encodes information about density, friction etc.